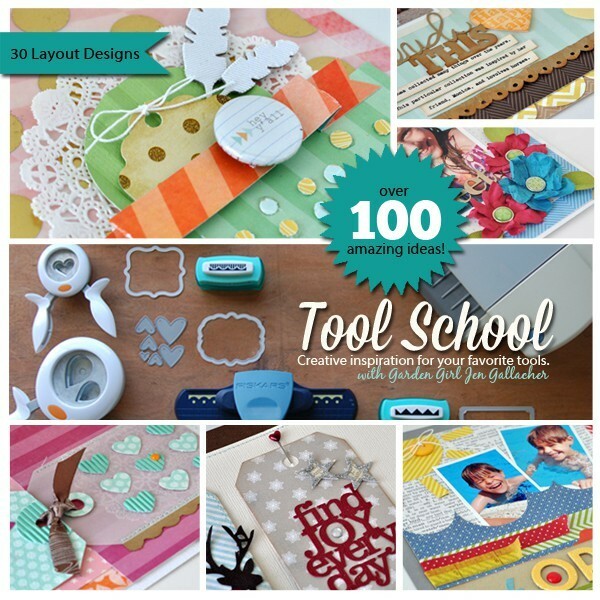 The winner of a spot in Jen Gallacher's Tool School Class is Pea: scrapnkristi. Congrats Kristi! I'll contact you on how to collect your prize. I think you are really going to love it. And I can't just post without a layout. 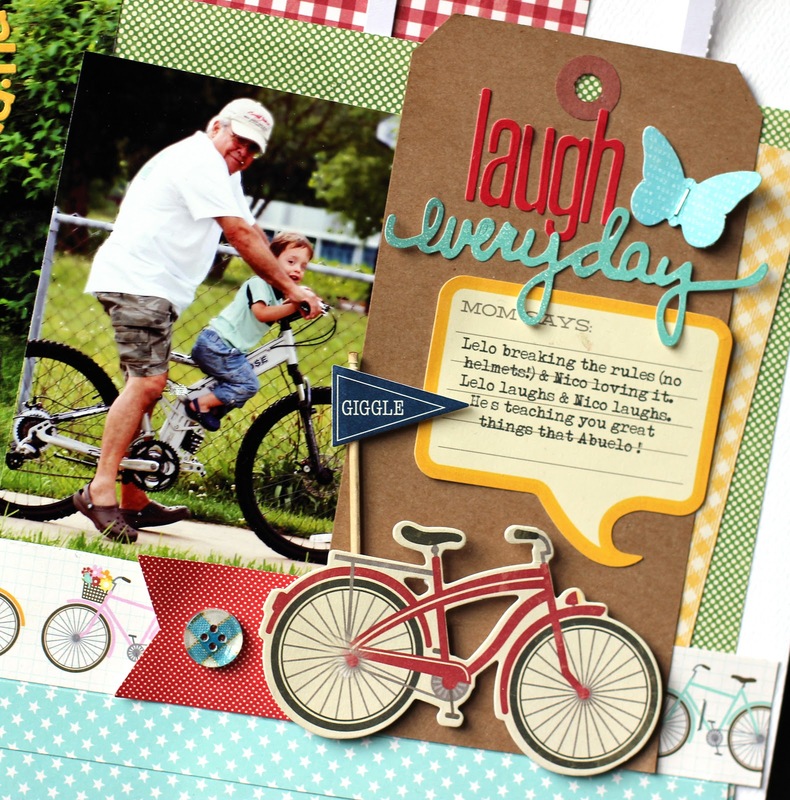 Here's something I made a while ago with the Sweet Girl Collection by Echo Park. I love the pretty colors and vintage feel in this line. I used just one photo to highlight this time. Mostly because it one of my favorites of her and I wanted the focus to be on the story here. That shy little girl grin captures my niece's personality at this age. It went perfectly with the the retro palette and icons in this line. 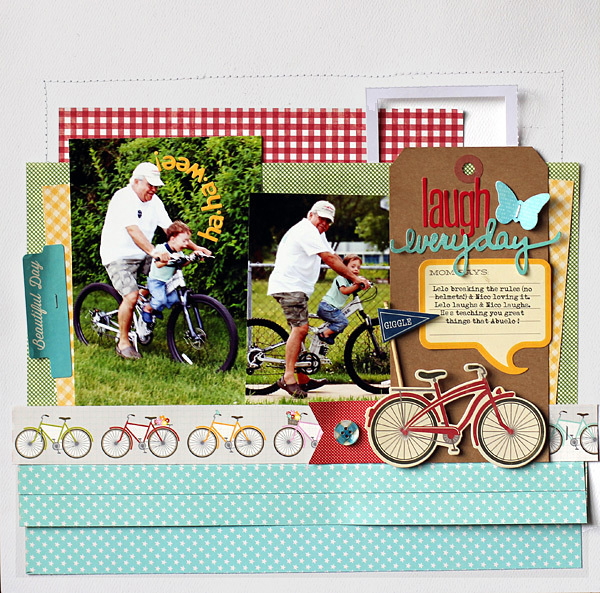 Layers of bold colors in tiny prints keep the focus on the picture. The title strip and journaling ground the layout. The white ledger paper across the middle ties together the photo, journaling and embellishment areas. The enamel dots leading to her age add a fun little touch to the page. I like using the entire 12x12 space even though there's only a single photo - it gives me more room for the fun stuff. My Dad and today's childrearing rules do not go hand in hand. The worst of them being bicycle helmets. He goes on and on about how as a kid the best feeling in the world for him was the freedom of speeding down the road on his bicycle - wind whipping through his hair. The more I try to explain that 'when you know better, you do better', the more he rolls his eyes at me. Sometimes I do wonder how I made it through my own childhood alive. We didn't have helmets or seat belts for that matter. So on this day, Grandpa was breaking the rules. No helmet bike riding. Now don't judge me too harshly, I didn't stop it because they were on grass and moving at a snail's pace. Nico was loving it. But then again, Nico loves anything that involves being naughty and rule breaking, so there you go. I loved watching them laugh together. 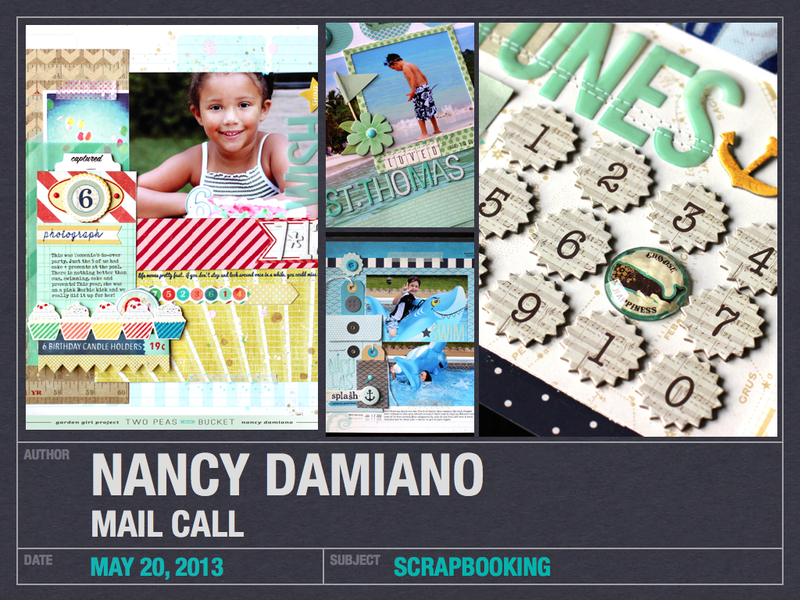 I based the layout on white card stock so that the patterned paper could really stand out and shine. I mixed primary colors and mostly small patterns randomly and then added the two photos. Notice how I added a small yellow subtitle right on the photo. That highlights both the photo and the meaning behind the page. The title cluster is grounded on the kraft tag. I chose kraft because it was different from all of the rest of the colors I was using plus the dark color was a great contrast. The script title stickers from Jillibean Soup make for great titles. I mixed all the colors of the layout on the tag so it would match and bring it all together. It's that time again. It's time to hop with the Garden Girls. Follow along to see sneaks, favorites and a chance to win a free class. A little something I've been working on for June. Stop by the Garden on 6/1 to see the reveal this month. Can you guess the theme? (hint: it's not Baby). I love Jody Wenke's style. She has a great talent for putting together clean, graphic pages that are visual eye candy. Just the right amount of color+design+detail. I find myself drawn to her great style. Set aside some time to browse her gallery. A now for the giveaway. Just leave a comment (with your PeaName) by 5/29/13 to win a spot in Jen Gallacher's Tool School Mini Workshop. Good Luck! Hop on over to Garden Girl Celine Navarro's blog for another chance to win. If you lose your way, find a list of all the Garden Girls participating on the 2Peas blog. I've been thinking lately about what I want to do with this blog. I took a break for a little bit, concentrating more on actual scrapbooking rather than writing about it. 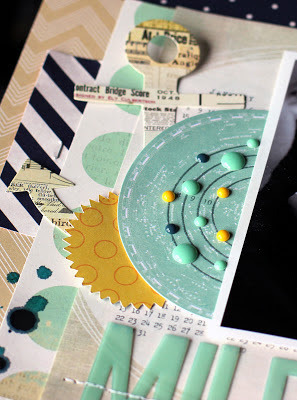 And while I loved the creative time, I missed the blogging . I like having a platform to share my work, life and pretty things. Although Pinterest and Instagram have been taking up most of my time, I took a minute to film a recent 2Peas order that I received. I thought it would be a nice way to come back to blogging. I'll be sharing some of process video on my YouTube Channel, as well as monthly Mail Call videos. I hope you like it! Click on the link below to watch.